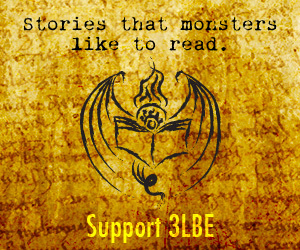 Three-lobed Burning Eye (3LBE) is a speculative fiction magazine published online twice per year, and annual print anthology every other year. 3LBE launched in 1999, and has published authors Laird Barron, Gemma Files, J.M. McDermott, Kelly Barnhill, Mari Ness, Cody Goodfellow, Shweta Narayan, Nadia Bulkin, Edward Morris, Kealan-Patrick Burke, and D.F. Lewis. Each issue features six stories. Beginning with Issue 20, we offer audio readings, PDF formats, and responsive web format for mobile devices. Placement: All ads will appear on the 3LBE homepage and on all subpages. Due Date: Image file + URL and payment must be received two weeks prior to start date. Disclaimer: All advertising is subject to the publisher’s approval. The advertiser assumes all liability for their ad content and responsibility for any claims made against 3LBE resulting from their ad. We will not consider ads promoting adult products or services, religious or political agendas, racism, sexism, scams, or poor taste.